We're not saying that your face should end up looking anything like "Starry Night," but when it comes to good makeup application, the makeup brushes you choose make a big difference. In other words, it's time to graduate past relying on the foam wands included in many eye shadow compacts. Skip to see the nine essential makeup brushes now. Investing in and using the right makeup brushes and tools will not only help give you a flawless makeup look, but you'll actually save money in the long run. How? Put simply, you'll use less product and your makeup will last longer (i.e. remain germ-free longer) if you keep your hands out of your colors and formulas. But with a gazillion different brush shapes and materials, it can be difficult to know which ones you actually need. You definitely don't need to tote around an arsenal of every makeup brush known to womankind in order to achieve a gorgeous makeup look. 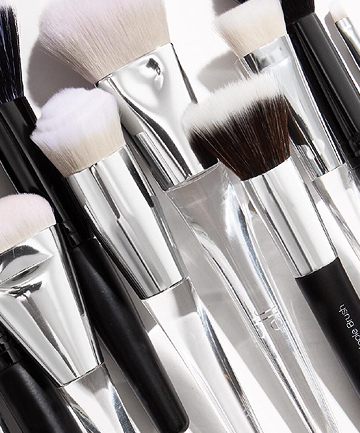 See the nine makeup brushes you need now. Very helpful, I've been staring at walls of brushes and then just walking away because I'm too overwhelmed to know where to start. A good assortment of basic brushes but would've appreciated a budget friendly option for each as well. Have found the Real Techniques Expert Face Brush to be fantastic for liquid foundation and the RT Powder Brush so ample and soft for powder application. I am completely clueless about brushes, so this was really helpful. Good info. And I just learned I've been using the wrong brush to contour my eye crease -- even though I own the right one! Will give it a try with the right one tomorrow. Excellent information! A retractable lip brush is something many women forget, but it makes a huge difference in your appearance. ELF DOES have great brushes--for a song--and I once used only all-natural ones. good info. also ELF has lots of good brushes that we not that expensive. Only seven? Make-up brushes are my favorite beauty product. Right now, I really am geeking out about Eco Tools.